Take a break from the sun. Spend an afternoon walking the historic downtown area and Maddox Blvd and enjoy the diverse array of local shops Chincoteague Island has to offer. Chincoteague is the home of many outstanding craftsmen and artists who produce some of the world's finest duck decoys, and paintings of wildlife, unique landscapes, and the world famous Chincoteague Ponies. Please scroll down for local shop listings and click to view their web sites. The Osprey Nest is Chincoteague's #1 stop for all your art needs and has been serving the community of Chincoteague and visitors for over 30 years. Our Art Gallery features paintings by renoun wildlife artist Kevin McBride. Our Gift Shop features a wide variety of souvenirs and gifts for all ages and budgets. Our exprienced custom framing department uses the materials and technology needed to preserve any type of art. Sundial Books is Chincoteague's locally owned year 'round full-service bookshop. Our inventory includes two floors of new, used and collectible books, including books about the Island and the Eastern Shore. Browse our eclectic collection of music cd's, as well as jewelry, art, gifts, journals and cards made by local artists. Relax in a comfortable chair and enjoy a cup of Green Mountain coffee or tea. Our goal is to make a space where our customers feel welcome. Check out our website for upcoming author signings, book talks, poetry readings, live music and other events. We specialize in old-fashioned customer service. If you can't find a book you are looking for, please let us know. We can order most books currently in print and will search our various resources for copies of used books. 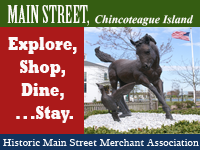 The Historic Main Street Merchants Association is a variety of local businesses that have come together to promote all the life and beauty that Main Street, Chincoteague Island has to offer. As an organization we have created some local events to promote commerce and community along with being a network for business communication and a channel to help local merchants work together in our beautiful island community. Our members are listed below.